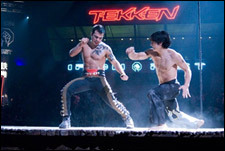 Tekken (Hindi), a Hindi movie, is not currently screening in Hyderabad. Hollywood's obsession with video games is a reality, and the reasons are simple. Most of tinsel town's young directors today belong to a generation that grew up on video games, and adapting them to scripts and movies, while not exactly a novel move, comes naturally. These filmmakers understand the language and the passion, and the present tech-savvy generation is definitely an audience. fullhyd.com has 700,000+ monthly visits. Tell Hyderabad what you feel about Tekken (Hindi), and then also see all user reviews for Tekken (Hindi)!